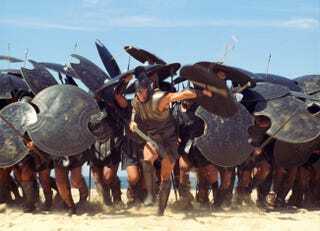 When it comes to graphic violence, modern movies don't have crap on The Iliad. In an amazing infographic, Greek Myth Comix's Laura Jenkinson aptly shows the number of brutal deaths in the classic of Western literature, how they died, who the most efficient killers were, and more. It's great. Alas, Jenkinson didn't publish the infographic in one convenient image, which I'm pretty sure means she doesn't want anyone republishing it — I totally respect it, she did some mighty impressive work. Please, all swift-footed myth-lovers should head to Greek Myth Comix's and check it out before the next rosy-fingered dawn.